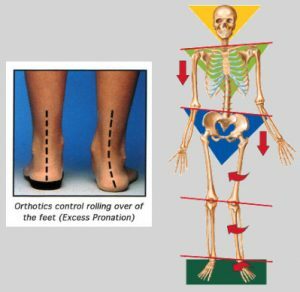 Orthotics and why I may need them? Foot Levelers make Spinal-Pelvic Stabilisers which are custom-made orthotics. Patients with certain types of spinal problems may benefit from custom-made orthotic foot support. The use of orthotics may stabilise the pelvis and spine. This addresses the structural problems within the feet thus reducing abnormal forces and stresses. Firstly, patients stand on a scanner plate and have their feet scanned. The scan duplicates any structural misalignment, stresses or abnormal forces in the feet. Secondly, the scan information, your shoe size and the type of orthotic required are sent to Foot Levers for the orthotics to be made to order. Many different styles of orthotics are available. A full range from sports performance and high durability work range through to court shoe and 3/4 length are available for patients of all ages. Finally, the finished custom-made orthotic is then placed in the patient’s footwear. This will help maintain the feet in their proper alignment. Depending upon the patient’s needs, the orthotics may have padding to cushion the foot against the weight of the body. How can Foot Levelers Spinal-Pelvic Stabilisers help me? Healthcare professionals know that alleviating pain in one part of your body may require treating a different part. As a result, abnormal forces and stresses in your spine may contribute to the pain you feel in your neck. These misalignments can be a result of the poor positioning of your feet. Very much like a chain reaction. By stabilising and balancing your feet, orthotics enhance your body’s performance and efficiency (posture), reduce pain, and contribute to your total body wellness. As a result, our custom-made orthotics compliment your chiropractic treatment when you stand, walk, and live your active life. To book an appointment for the scan and assessment please call Woden Chiropractic on 62815494. Visit us at Unit 2 Gadal Chambers 48 Corinna Street Woden Canberra ACT to make an appointment.